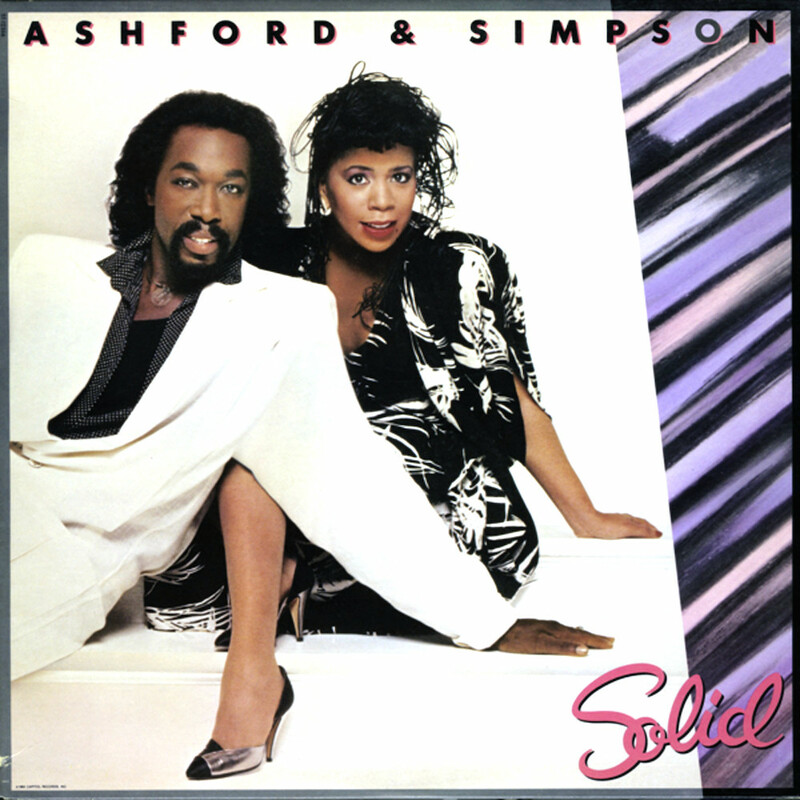 Today’s POP RESCUE is the 1984 LP Solid by husband and wife duo Ashford and Simpson, but was this really such a sturdy album? Read on.. This 8 track vinyl album opens with lead single and their biggest hit Solid, a song which became synonymous with their name (at least here in the UK). From the moment it begins, you can tell that it’s going to be a powerful 80’s belter. It reached #3 in the UK in 1984. Up next is their second single Outta The World, although this didn’t chart in the UK (and scraped up to #102 in the US). It opens with some space-like sounding synths, over a wonderful 80s bass synth. Nickolas takes the lead vocal for the first verse, giving way to Valerie in the second one. The pair come together for the chorus, and their voices compliment each other perfectly, and the song really gives them plenty of space to shine. I can see why this was released as a single, but I think that it might have been a little ahead of its time. This is followed by The Jungle, the first of two songs to be taken from the break-dancing film Body Rock (1984). This is a short upbeat song, laden with a great bassline and the vocal duelling I’d once again perfect. Valerie really shows off her vocal range here too, with Nick coming in sounding a little bit between contemporaries Lionel Richie and Michael Jackson. The tempo slows right down for this piano-led ballad Honey I Love You. This is an 80s love song by numbers, and they wield it wonderfully. You just know that this husband and wife duo mean it too. Both really shine with their vocal harmonies, especially towards the end. Side Two opens with the handclaps, snare drum, and twanging guitar intro of third and final (although second in UK) charting single, Babies. Lyrically, this song is occasionally a little creepy, with the line ‘your mama should have told you babies were made in heaven‘, and whilst Valerie makes the most of the difficult lyrics, it wasn’t enough to secure them another hit, and it scraped up the charts to #56 in the UK (and #102 in the US!). The couple wander off into heavenly clouds at the end of the video.. presumably with their own musical career. This is followed by Closest To Love, the second of the songs from the Body Rock movie. As with the other one, the tempo is up and reminds me of the Pointer Sisters singles are about the same period. This track has a great 80s pop beat, and Valerie makes fantastic work of the vocals, and a mid-section of beats and bass reminds me briefly of Michael Jackson’s Thriller before it heads off to the final push with the chorus. Cherish Forever More is up next and this takes us back to a slower love song with Nick returning to join his wife on vocals. The pair show off their vocal power and range, and are momentarily joined by Obligatory 80s Saxophone for a mid-section solo. The album closes with Tonight We Escape (We Make Love), and this takes the tempo even further down. For a moment you could easily think you’re listening to Lionel Richie and Diana Ross, or it could even be mistaken as a Dina Carroll track, as the pair softly sing together as a string section swells soars in the background. The strings deliver this loving couple to the end of their album, which is just as well as they’ve already clearly decided to make love. Over all, having bought this album knowing only one song (the title track), it turned out to be slightly less pop-rock than that hit. This is by no means a disappointment, and aside from some wobbly lyrics in Babies, the rest of this album is slick, perfectly (and undoubtedly lovingly) crafted, and both Nick and Valerie absolutely shine. It’s a great example of early 80s love songs. Where are Ashford & Simpson now? With the commercial failure of their single Babies, the duo managed to chart in the UK only one more time with single Count Your Blessings in 1996. It stalled at #79, and they have never charted since. The duo found had greater success as songwriters – responsible for Chaka Khan‘s huge 1978 hit I’m Every Woman, and in the 1960s with Ain’t No Mountain High Enough and You’re All I Need To Get By for Marvin Gaye and Tammi Terrell. However, their own musical career was short-lived. Despite this, it didn’t stop them receiving great recognition, and they both earned a place in the Songwriters Hall Of Fame in 2002. The duo performed Solid as Barack at the inauguration ceremony of US President Barack Obama in 2009. Sadly, Nickolas died in 2011 from throat cancer. Valerie has continued to write and record, with her most recent album being Dinosaurs Are Coming Back Again in 2012, featuring the final recording by Nina Simone, and a track with Roberta Flack. POP RESCUE COST: £1.00 from Fordham Carboot Sales. Posted in 1980s, Ashford & SimpsonTagged album, Babies, Body Rock, Nickolas Ashford, Outta The World, review, Solid, Solid As Barack, Valerie SimpsonBookmark the permalink.